When craft beer super fan Steve Dass gave up alcohol for health reasons, he went looking for a quality non-alcoholic substitute. He couldn’t find one, so he started his own brewery. “When I … started talking about it to friends and investors, they asked whether I’ve bumped my head or something,” said Doss. But Dass was onto something: His Nirvana Brewery in London now brews 3,200 liters of low and alcohol-free beer a week, and he sells to stores such as Whole Foods. It’s still a very niche segment, but big brewers are scrambling to get in on the action. That’s because drinkers are turning to brews that don’t come with a buzz. They’re increasingly worried about the health risks associated with alcohol. Anheuser-Busch InBev(BUD), which launched non-alcoholic versions of Budweiser and Corona in 2016, predicts that low or alcohol-free beer will make up a stunning 20% of its production volume by 2025. Heineken(HEINY) released a competitor — Heineken 0.0 — last May and Guinness owner Diageo (DEO) followed suit in January with Open Gate Pure Brew. Carlsberg(CABGY), which has been producing alcohol-free beer since 2015, expects revenue for that product to grow three times faster than overall beer sales. Brewers are responding to changing consumer tastes, but there’s another powerful incentive driving the trend: Non-alcoholic beer generates 1.5 times more revenue because there’s no alcohol tax to pay. 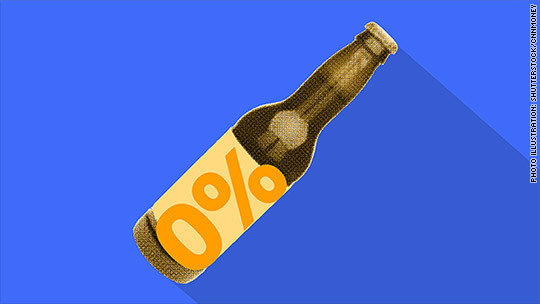 Stuart Elkington opened Dry Drinker, an online store selling non-alcoholic beer, wine and spirits, when his doctor suggested he stop drinking alcohol to improve his fitness. He gave it a shot for six months and felt great. “I lost a bit of weight, I started running again … but I missed that ‘ahh’ moment on a Friday night, when you’ve had a really busy week and just wanted a beer,” he said. But he was surprised to find the market is much wider than that. “Our customers are the girls getting together when they have to work in the morning, the baby shower crowds, the guys training for marathon, dinner parties when someone has to drive,” he said. His business, which launched just 18 months ago, now has five full-time employees. Previous PostWhat Manufacturers Really Mean By Natural And Artificial Flavors?